Coatings are applied with a roller or brush and adhere directly to the floor. Paint and epoxy are the chief products in this category. Coverings are products that are set on top of the garage floor. They can be moved or removed at any time. Tiles and mats are products that fit this description. Below, you can find brief descriptions of the choices, with links to more detailed information and how-to instructions. All good garage floor coatings begin with preparing and repairing the concrete surface. Find information on crack and stain repair below. Finally, those turning their garage into living space will want to study the different methods of insulating the floor as well as enclosing the big opening in the wall created by removing the garage door. If your garage floor is stained with oil, grease, ​and rust, you can easily give it new life with some garage floor paint. 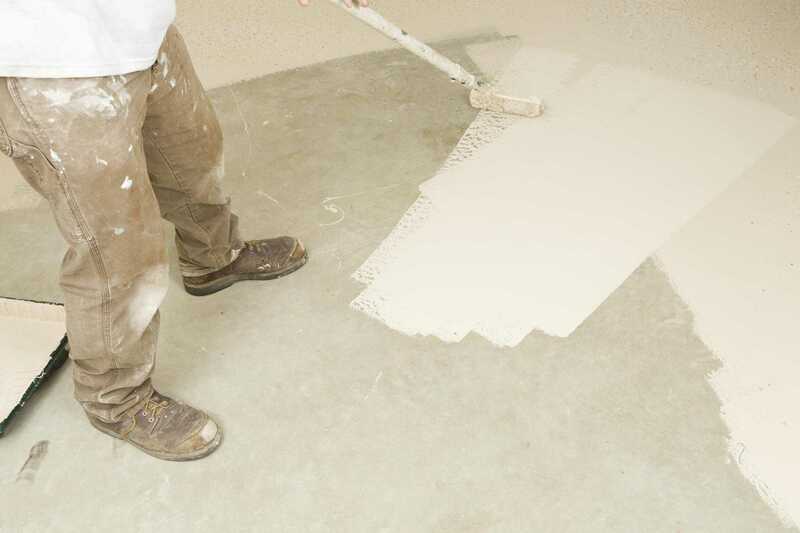 Latex paint intended for use on concrete floors is relatively inexpensive and easy to apply. Before you start on a garage floor epoxy job, however, you need to decide which style of epoxy to choose from. There are three basic types of garage floor tiles – rigid plastic tiles, flexible rubber and plastic tiles, and wood composite tiles. There is no easier way to cover your garage floor than by rolling out a mat. Garage floor mats come in a variety of styles, colors, and materials. Garage floor coatings and coverings shouldn't be viewed as a means of putting damaged slabs in an "out of sight, out of mind" condition. Oil and grease stains make any garage floor unsightly and messy, but they can also cause problems with paint and epoxy finishes. Finally, those garage floor coatings and coverings will not eliminate moisture problems, nor will paints and epoxies last long on concrete that is too wet. If you are converting your garage into a living space, or even if you just want to make your garage more comfortable in cold and hot weather, you should consider insulating the concrete slab. For a garage conversion, preparing the floor involves more than simply adding some insulation and installing a finish floor surface. If you plan to remove the garage door, you will also need to fill in the opening this step creates.